The Australian Red Cross will deliver a Drought Community Support Program to build resilience and capacity amongst individuals, families and communities who are impacted by the severe drought currently affecting NSW, QLD and other areas. Recognising that drought has a long term, insidious and complex impact, and that it has now reached a crisis point in many parts of NSW and QLD (but also in other areas), the proposed program will focus on social recovery. Along the same principles of other disaster recovery programs, Red Cross will put in place community recovery officers, who will work with local people, agencies, business and government to develop plans that support the already heavily tested resilience of rural communities and enable them to take control of their own resilience. Teen Challenge Tasmania, founded in 2014, specialises in the alcohol and other drugs sector in treatment interventions, and prevention through education. Their flagship #NotEvenOnce alcohol and other drug prevention and early intervention program is delivered to primary and high school students, parents, teachers, sporting clubs, communities and workplaces. It provides information, social skills, personal resilience, and understanding to assist young people and communities to avoid the risks of substance abuse. This program has had remarkable results with 68% of students reporting a positive shift away from initial indication of being likely to use alcohol. Their Connections Mentoring Program is a prevention and early intervention program that matches volunteer adult mentors with at-risk young people who may be struggling with their physical or mental health, socially or educationally. Students with a dedicated 1 to 1 mentor show significant improvement in their relationships with their peers, family and friends. This grant will fund new equipment to support the expansion of their #NotEvenOnce and Connections Mentoring Programs to thousands of young people across Tasmanian metro and rural communities over the next 12 months and beyond. 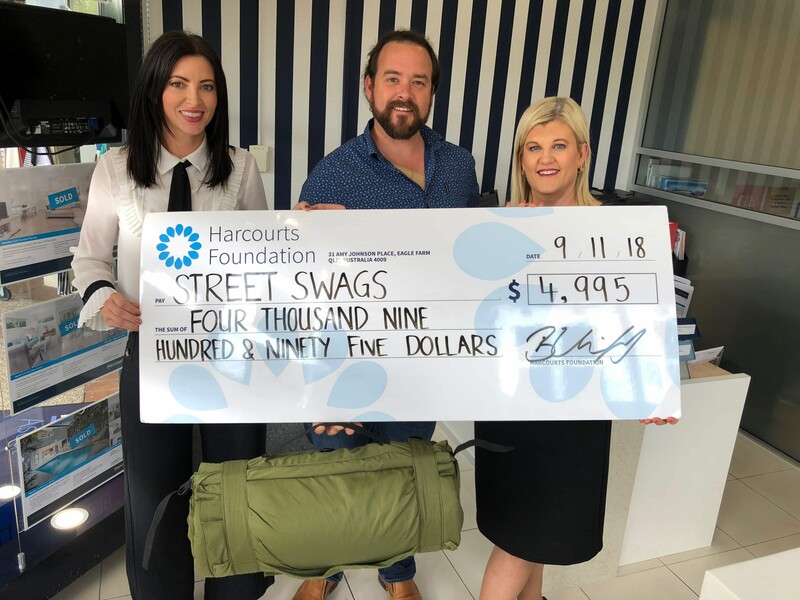 Street Swags provides temporary basic bedding and shelter to those who are homeless, vulnerable or needy in order to reduce the amount of illness and the number of deaths attributed to homelessness and sleeping outdoors without adequate protection from the elements. They promote community awareness and education concerning the homeless, vulnerable and needy, and the dangers and disadvantages they face sleeping outdoors. The swags are currently manufactured at Woodford Correctional Centre as part of a training program that provides prisoners with trade-recognised skills and qualifications to help them reintegrate into society. They are then taken to St Joseph’s Nudgee College where students insert the foam and any donated items into the swag and ready them for distribution. Coming into the busy Christmas period, the Grant was used to purchase canvas which made 227 swags and help 227 people to have a safe and comfortable nights’ sleep out of the elements. The Pat Thomas House’s purpose is to provide short-term emergency crisis accommodation and services for women and children living in and escaping from Family and Domestic Violence. The Christmas period can be a stressful time which unfortunately exacerbates domestic violence. Women and children who come to our service may come with just the clothes on their back and very limited resources. Through their local community, Pat Thomas are putting together donated items into food hampers (non-perishable food). This grant will enable them to complete the hamper with a $30 voucher with which clients can purchase perishable food such as milk, fruit and vegetables. This grant of $3000 will provide 100 vouchers for $30 each. Burlendi Youth Housing makes up one half of the Inner North and North East Youth Homelessness Service. Located in the Northern Suburbs of Adelaide, Burlendi is an 8-bed crisis accommodation service for young people who are experiencing homelessness or at high risk of homelessness. Burlendi works to provide young people with a sense of stability following a period of homelessness and family and relationship breakdown. They work with each person with 24/7 support as they transition into onsite units, increase independence, and create of a home environment. Harcourts South Australia partnered with both The Salvation Army Men’s Shed and Tyndale High School to build four cubby houses, which were auctioned, decorated, and either sold or raffled to raise funds. These funds will be used to upgrade facilities including painting, new furniture and household items and upgrading the garden and outside area. Little Heroes Foundation raises funds to support seriously ill children and their families, and since 1996 have contributed close to $20 million towards lifesaving equipment and facilities at Adelaide’s Women’s and Children’s Hospital (WCH). For the past 7 years, they’ve also supported families directly through their Little Heroes Care Program, which works closely with like-minded charities and medical institutions to provide practical services to families such as medical, educational and financial support. Over the past 12 months, Little Heroes has assisted 107 children and their families through this program, including in-home nursing, food and fuel vouchers, professional cleaning, payment of household bills, backyard play equipment and car parking. The grant funds, raised via auctions at the Harcourts South Australia’s Quarterly Awards, will be used towards this program. Established in 1997, Gold Coast Recreation and Sport Inc (GCRS) aims to promote recreation for people with a disability through assisting in the coordination of its development, planning and funding. Gold Coast Rollerblaze is a GCRS wheelchair basketball programme established in 2008 by a small group of volunteers to support Gold Coast residents with a physical disability to participate in sport. They actively promote this “other form of basketball” to able-bodied players and 20% of players are abled-bodied which allows family members to play sport together after a serious accident. Rollerblaze has produced two players who progressed to play for Australia at the Rio Paralympic Games, and two players who play for Queensland at a National level. A weekly social competition is held at Coomera Indoor Sports Complex. 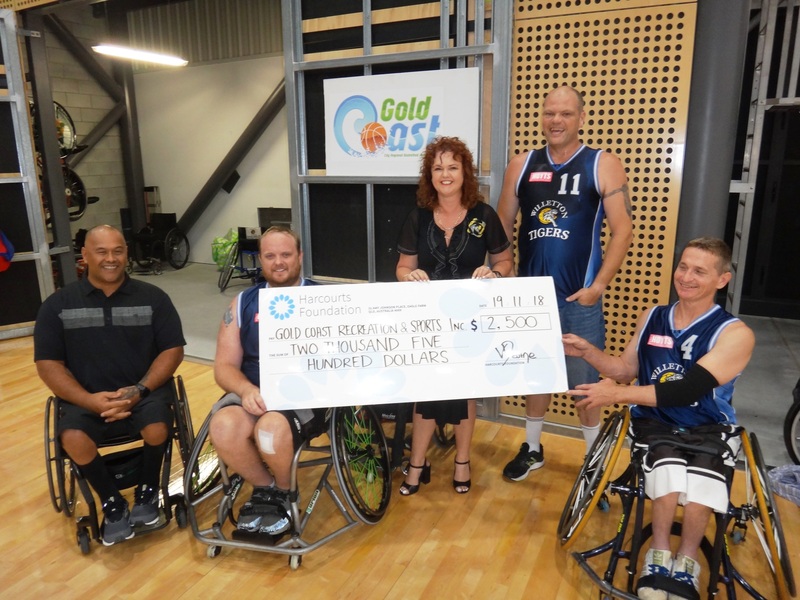 The short-term goal for this grant is to maintain/repair their aging fleet of 29 donated, specialised basketball wheelchairs to enable the program to give new players the opportunity to try the sport and to facilitate Corporate Challenge Day fundraising. With a replacement cost of close to $6,000 each, repairs and maintenance, averaged across the 29 chairs, is $100 per chair per year. This grant of $2500 will assist with the costs of repairs. Since The Harcourts Foundation’s first donation in 2008, over $5 million has been raised. That translates to 700 charities supported, 311 communities impacted, and over 900 grants made through Harcourts offices in New Zealand, Australia, South Africa and the USA.